Thoracic endovascular aortic repair (TEVAR) is one of the choices for the management of thoracic aortic aneurysms. However, the complications of this procedure remain undetermined. We present the case of a fatal clinical finding, which can be a complication of TEVAR. A 91-year-old male patient was referred to our vascular unit through the otorhinolaryngology department with horsiness of voice and dysphagia for 6 months. Arterial-phase contrast-induced computed tomography showed a descending thoracic aortic saacular aneurysm (diameter: 6 cm) located just distal to the left subclavian artery [Figure 1]a. He underwent uneventful TEVAR (GORE, C-TAG, 31 mm X 150 mm) as shown in [Figure 1]b. He was discharged in a stable condition with regular clinical and radiological follow-up 1 month and then 3 months postoperation without significant clinical complaint or radiological abnormalities as shown in [Figure 1]c. Four months later, he presented with hematemesis and was admitted again. Upper gastrointestinal endoscopy showed a mid-esophageal ulcer with a blood clot and an aortoesophageal fistula. The patient was admitted urgently as his vital signs were unstable: blood pressure – 60/30 mmHg; heart rate – 140/min; and Glasgow coma scale – 6. He was resuscitated and received six units of blood. He underwent urgent intraoperative conventional aortic angiography that showed proximal migration for the aortic stent with possibility for distal aorta disruption at the distal part of previous aortic aneurysm and aortoesophageal fistula [Figure 2]a. Distal new stent graft extension (GORE, TAG 37mm X 150mm) with 50 mm overlap with distal extension stent graft. 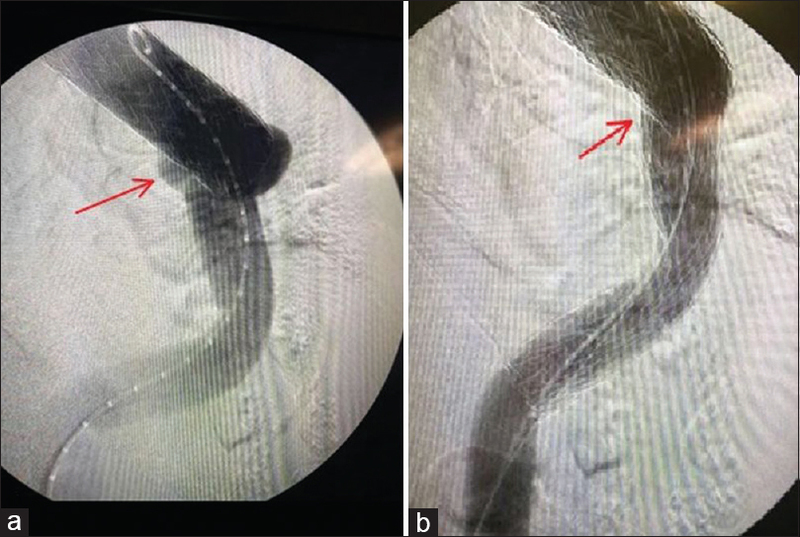 Angiography shows complete exclusion of the leaked aneurysm and fistula [Figure 2]b. Fifteen hours later, he experienced another attack of massive hematemesis, arrested, and did not survive. To understand how this complication may occur, several hypotheses have been made. Coverage of the aortic side branches that feed the esophagus by the stent graft leads to ischemic esophageal necrosis. The oversizing of the device by 10%–20% increases the aortic diameter and may lead to esophageal compression and a decrease in its lumen. The passage of the bolus in the compressed esophagus and mycotic aortic aneurysms may lead to injuries in this organ also., Last hypothesis, which we intend to support with this case, is the presence of endoleak into the residual aneurysm with subsequent esophageal pressure. Although different therapies for aortoesophageal fistula, such as surgical aortic repair and esophageal fistula resection via a left posterolateral thoracotomy,, have been reported, aortoesophageal fistulas still have a high mortality rate. In this report, we aim to highlight this clinical finding, which is a complication of TEVAR. Aortoesophageal fistula is an uncommon but fatal complication after TEVAR. Therefore, all surgeons should be aware of this complication and its primary symptoms, and this may provide immediate treatment. Norgren L, Jernby B, Engellau L. Aortoenteric fistula caused by a ruptured stent-graft: A case report. J Endovasc Surg 1998;5:269-72. Azabou N, Chaouch N, Saaidi A, Romdhane NB, Aouini F. Aortoesophageal Fistula after Thoracic Endovascular Aortic Repair. J Vasc Med Surg 2016;4:287. Eggebrecht H, Mehta RH, Dechene A, Tsagakis K, Kühl H, Huptas S, et al. Aortoesophageal fistula after thoracic aortic stent-graft placement: A rare but catastrophic complication of a novel emerging technique. JACC Cardiovasc Interv 2009;2:570-6. Tehrani HY, Peterson BG, Katariya K, Morasch MD, Stevens R, DiLuozzo G, et al. Endovascular repair of thoracic aortic tears. Ann Thorac Surg 2006;82:873-7. Gavens E, Zaidi Z, Al-Jundi W, Kumar P. Aortoesophageal fistula after endovascular aortic aneurysm repair of a mycotic thoracic aneurysm. Int J Vasc Med 2011;2011:649592. Albors J, Bahamonde JÁ, Sanchis JM, Boix R, Palmero J. Aortoesophageal fistula after thoracic stent grafting. Asian Cardiovasc Thorac Ann 2011;19:352-6. Chiesa R, Melissano G, Marone EM, Marrocco-Trischitta MM, Kahlberg A. Aorto-oesophageal and aortobronchial fistulae following thoracic endovascular aortic repair: A national survey. Eur J Vasc Endovasc Surg 2010;39:273-9. Kouritas VK, Dedeilias P, Sotiriou K, Klimopoulos S. Delayed presentation of aortoesophageal fistula after endovascular repair. Asian Cardiovasc Thorac Ann 2016;24:51-3.